September vehicle sales blew past expectations (13.04M annualized rate vs. 12.6M expected), while registering a sizable 11.2% increase in the past year, and a 14.3% increase since last June's low. This, despite the Japanese tsumani earlier this year that caused extensive supply-chain disruptions and resulted in a huge drop in sales from February through June. Suffice it to say that auto sales do not conform at all to the current narrative about the economy being on the ropes. September sales were 40% higher than the low registered in February 2009, which works out to a 13.8% annualized gain. 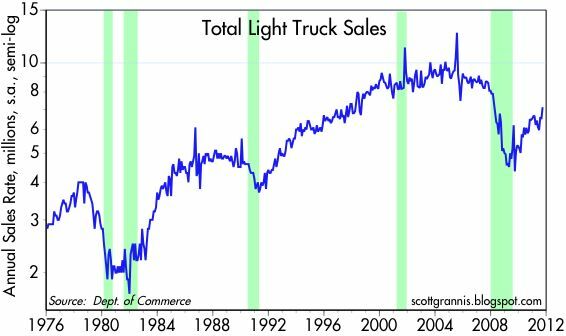 UPDATE: At the suggestion of Mark Perry, I put together this chart of light truck sales, which account for just over half of total vehicle sales. The recovery in light truck sales has been a good deal stronger than for total vehicle sales, and sales were disrupted far less this year, since domestic light trucks account for about 85% of total light truck sales (less tsunami impact). Since the low in April '09, light truck sales are up by an impressive 58%. Definitely no sign of a recession here! Shaky action on markets today. The ECB and Fed need to state clearly they are targeting about 7 percent nominal GDP growth. This is going to screw up a lot of people. Stock market tanks, and economy still humming along. Indeed. There is a huge disconnect between markets that are priced to the end of the world as we know it, and statistics that show that many sector so of the economy are still growing. I understood that for America just to maintain its automobile/truck fleet it needs to "purchase" 13 million vehicles. Anything below that is a distinct problem, as the fleet average age rises. 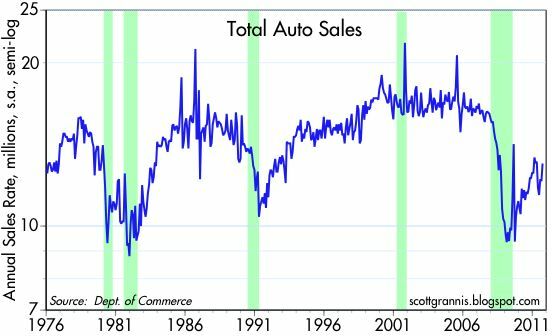 My point is that at the current depressed levels little can be concluded as to general economic health based on rising vehicle sales. Of course, unlike you Scott, I am a bear... So I see negative everywhere. Frozen has it right, the growth in auto sales is a function of need, not discretion. Need has been pent up and now purchases must be made. This has little to do with a "healthy economy", but just what must be done. My own business vehicle will need to be replaced sometime in the next year or two, if I can get it to last that long, if not I will have to replace it willy-nilly. I can tell you that out here in the hinterlands the ordinary citizen, ignorant of charts, is not buying anything like an automobile unless it is necessary.